In this tutorial, we will show you how you can now use DxO OpticsPro 10 to enhance your GoPro® images and image sequences. By using one of DxO OpticsPro’s dedicated presets, you can automatically correct the exposure, contrast, colors, noise, vignetting, sharpness, and especially the distortion that is typical of GoPro® images. Depending on the model, the GoPro® Hero is a camera capable of shooting video with a resolution of up to 4K and of taking photos up to 12 MP (with burst shooting at up to 30 images a second). Compact and portable, it can be attached anywhere — on a vehicle or on a person — for spectacular shots. Your GoPro® photos and videos will have a more professional quality and look, thanks to the power and efficiency of DxO OpticsPro 10’s correction tools. To deal with time-lapse sequences or videos, you will need video editing software such as GoPro® CineForm Studio or Quick Time Pro. 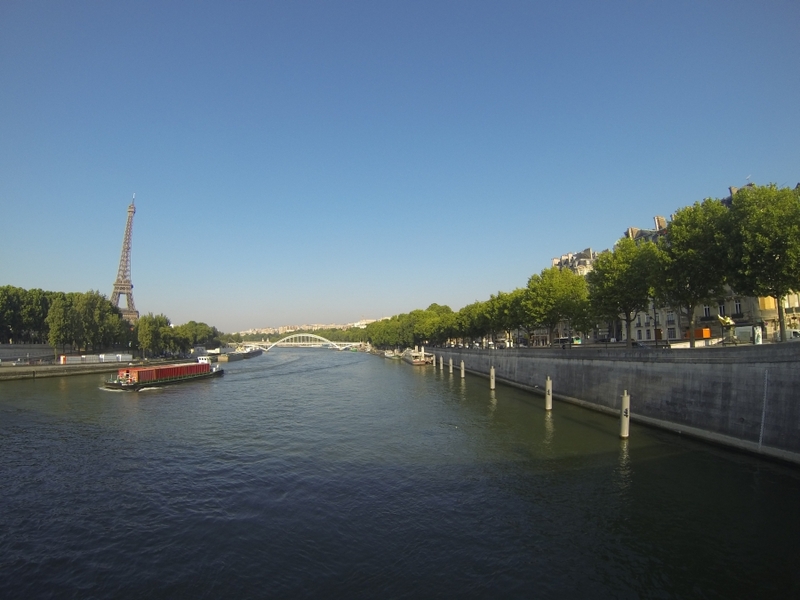 Some images or sequences recorded with a GoPro® camera. 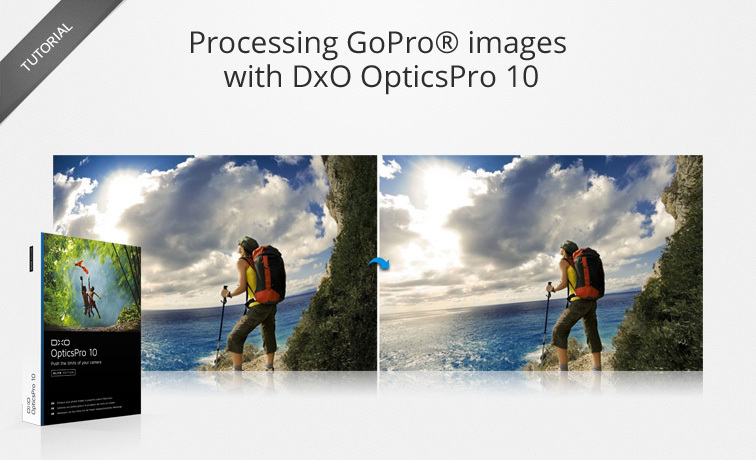 Processing a GoPro® photo in DxO OpticsPro is extremely simple. The DxO Standard preset is automatically applied to your image as soon as you open it in DxO OpticsPro. 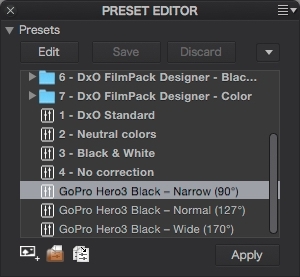 This preset is a collection of basic corrections that act upon the exposure, contrast, colors, noise, vignetting, sharpness, and particularly upon the distortion that is a principal characteristic of GoPro® images. 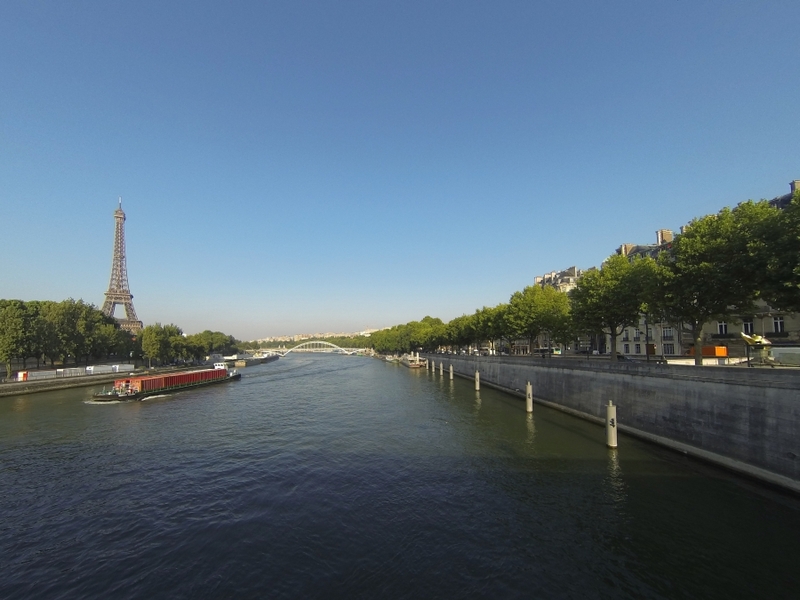 The distortion present in GoPro® images can affect how the horizon line is perceived. After the image is corrected, it is possible that the horizon line will still not be straight, in which case you can straighten it using the Horizon tool in DxO OpticsPro. This correction is accompanied by an automatic cropping that optimizes the framing when you use the Horizon tool. button in the Image Browser toolbar. You have several options: you can Export to disk, Export to application (to open the image in a different software program), Export to Lightroom (to catalogue your image or to use Lightroom’s correction tools), and you can export your image to your Flickr® gallery or Facebook®. A time-lapse is a series of still images taken over a given time period, and then projected at an accelerated rate. As in the first section of this tutorial, all you need to do is open your image sequence in DxO OpticsPro in order to automatically apply the corrections of the default preset to each image in the sequence. 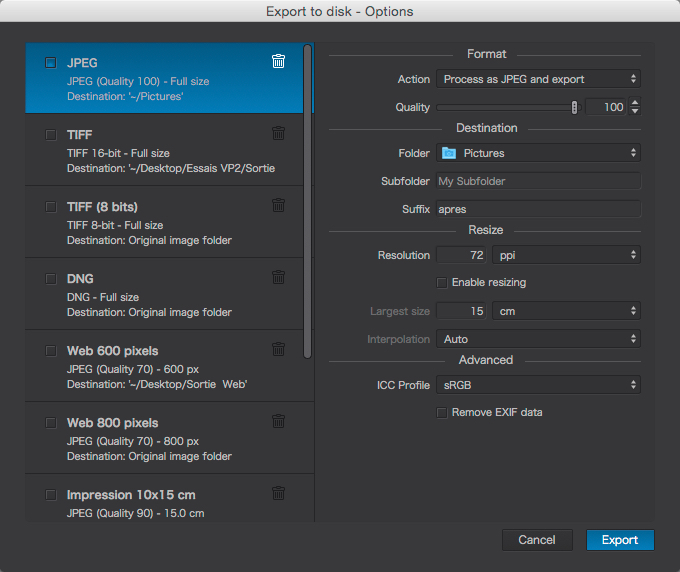 Batch processing is also done via the Export to Disk feature, where all you need to do is choose your output options (format, including resizing if necessary) so that your corrected images are compatible with your time-lapse editing software. To best organize your work, you may want to create a Project using this sequence of images. As soon as you have processed and exported your image sequence, all you need to do is import it into a video editing application, such as GoPro® CineForm Studio or Quick time Pro. Certain video editors will let you extract a sequence of images from a video. You can process this image sequence in DxO OpticsPro before reassembling it as video. It is possible to extract the soundtrack of the original video and then remount it onto the newly-produced video, so long as you keep the same number of images per second. Consult the documentation of your video production software for more information. QuickTime Pro is one such application that offers this possibility, but there are many other solutions, both free and paid. Converting a video into an image sequence results in a loss of EXIF metadata, which is is necessary for applying the DxO Optics Module specific to a given camera. This means that camera-specific Optics Module corrections cannot be automatically applied to the extracted images. However, we can provide you with presets that reproduce the identical corrections found in the corresponding DxO Optics Module (see step 1 below), which you can then apply to your images. icon in the Presets Editor in the presets editor palette. Your preset is now ready to be applied to your image sequence. drop-down menu in the principal toolbar and choosing the preset from the menu list. The automatic corrections of the DxO Optics Module will be applied to the entire sequence. Then launch the export of the image sequence (click on the blue Export to Disk button in the Image Browser toolbar). After processing your images, import them into your video editor to reassemble the sequence. All of the DxO Optics Pro corrections available in the Customize tab can be applied to your GoPro® photos or extracted video images. This means you can benefit from DxO OpticsPro’s corrections for colorimetry, sharpness, horizon, and even perspective. Note that correcting for distortion can eliminate certain elements within the framework of the photo. You can recover these elements by choosing not to preserve the proportions of the original image. To do this, uncheck the corresponding option in the Distortion sub-palette. You can then crop your images and choose, for example, a 16/9 ratio to lend a cinematic effect to your images or videos. If necessary, you can also correct volume anamorphosis so as to restore the natural proportions of the subjects situated on the edges of your images.